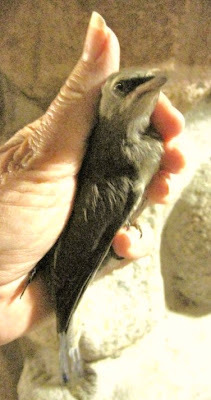 What do we do when birds are injured on the way south on migration? The answer is it really depends on the kind of bird and how south they need to go before they reach their winter destination. Sometimes we network with wildlife rehabilitators in other states. In the case of passerine birds like robins or bluebirds, once they are have recovered, we can transport them to a state where flocks of their species are still moving through. In many cases the Southern U.S. is their winter destination. That is not going to work for this Broad-winged Hawk however nor for the species of birds that winter in Central or South America. 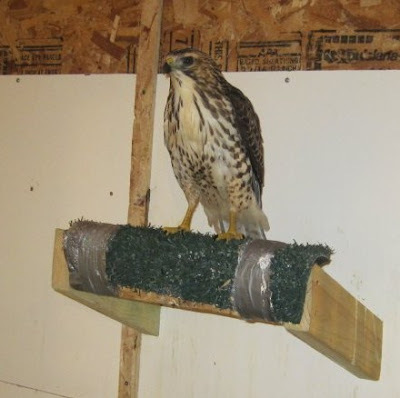 The young Broad-winged Hawk in the photo above was admitted to REGI in late September. He had a fractured wing. The "kettle" of other Broad-winged Hawks with whom he was migrating, continued on their way. He healed quickly and is now flying. He needs a few weeks of stamina training in the flight building to assure he is back in perfect form however by that time others of his species will be enjoying the weather in Central and South America. He is stuck here in cold Wisconsin. How the heck do we get his there? That is the question. We could find a private pilot to fly this youngster to Texas or Arizona, but this late in the season, he would be alone. Crossing the International Border into Mexico is not something that we are allowed to do. That limits the options for this youngster. In the end he and many others will "winter-over" with us at REGI. 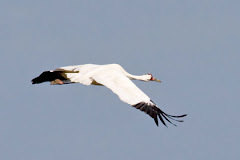 They will rejoin the flocks of returning birds in late spring. Over-wintered birds are kept in a heated area indoors until the weather is acceptable for their particular species. Next fall he will have the chance to travel to distant countries. Wildlife rehabilitators have to have a strong network of many people from other wildlife rehabilitators, birders, biologists and even pilots to help assure the best success for our patients once they are released. Connie drove a young Cedar Waxwing over from the Stevens Point area this evening. He was in the street wet and hypothermic when she found him. He had some bad luck earlier in the day but his luck changed when Connie found him and got him help. Many thanks to her for making a difference for this little one. He is doing much better tonight. While he still prefers to sit by a heat lamp, he is eating and making friends with several other Cedar Waxwing patients currently in care at REGI. He doe4s have a broken wing, but we expect him to make a full recovery. It is a good thing when we have other patients at REGI of the same species. The stress level of captivity is decreased when they know they are not alone at this place. I have had questions this past week about Cedar Waxwings. Many appear to be in trouble. In the interest of time I will cut and paste a reply I offered someone that found several Cedar Waxwings in his yard that had died. When we find more than one bird in a yard recently dead there are a few things we think of. Most homeowners that care about wildlife and birds do not use pesticide. That does not preclude your neighbors from using products that are hazardous to birds. Cedar Waxwings eat both insects and berries. Either of which can be either sprayed or somehow "treated" with a toxin in efforts to prevent a fungal problem or parasite. Even lawn treatments when freshly applied can be mistaken for seed. The chemical can absorb into the skin of an insect and then be ingested by birds. Many hummingbirds for instance are killed when flowers are treated with powered fungicide which first absorb into the bodies of aphids before hummingbirds eat them. Even a bit of the actual powder can be ingested accidentally. We have come across a situation where a youngster has a new b b gun and shoots his neighbors birds. That is particularly true with flocking birds during migration. It is not always visible that the bird has been shot. This is strictly illegal, but unfortunately does occur more often than I want to admit. Odd as it seems berry eating birds can become intoxicated on berries and crab-apples. The temperature changes causes the berry to ferment. Just like fermented berries are used to make wine the same thing happens to the birds when they eat the berries. Simply put they become intoxicated. That condition causes the birds to go into a low metabolic state. If the weather turns unseasonably cold the birds can die as they are unable to get their heart rate up and therefore their body temperature. That does occur and would apply in our recent weather in WI this past week. Disease is possible but not likely unless the birds are carrying a chronic problem. That can overwhelmed the birds when cold temperatures hit. Low body weight could be an issue in very cold temperatures. Cedar Waxwings have a wide food base so lack of natural food does not usually apply. It was a problem for many species this spring however including all species of swallows, Purple Martins and other insect eating birds. Even Sandhill Cranes colts were affected when their died before they were thermo regulating and after hatch when it was so cold. Even with WNV we don't find birds grouped together unless it is a family that dies together simply because they refuse to leave each other. Hope you found the information helpful. Have a good night everyone. Oooh, nice Broadie! I hope he has a warm, quail and wrodent-filled winter with you Marge. I'd be happy to take him in, but somehow think I'd have some trouble getting a permit. I hope one of those fine staff people will enjoy short winter walks with him...not too long to get too cold but enough to stay curious? How far south does he need to go? Mexico, Belize, or, all the way to Peru? Diesel, how lovely to hear from you! I was wondering if you were going to read about the Broad-winged Hawks. I know your family is partial to them. You know it kind of depends on who they migrate with as to how far south they go. Some could even stay in the U.S. but I like to think the Broadies that come out of REGI are high achievers and move with the Turkey Vultures and Swainson's Hawk to Argentina. You will love the blog story I am writing today. It has links to the Oregonian Newspaper and is all about Turkey Vultures raised at REGI that are now in Oregon being important to LOTS of people. They are having a contest to name them. You should enter!